Aero Chicago Parkour | Parkour/Freerunning in Chicago and the surrounding suburbs. 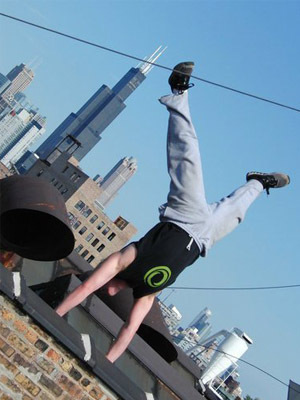 Aero/Chicago Parkour is a community of Traceurs (Parkour Practicioners) from Chicago and the Chicagoland suburbs. 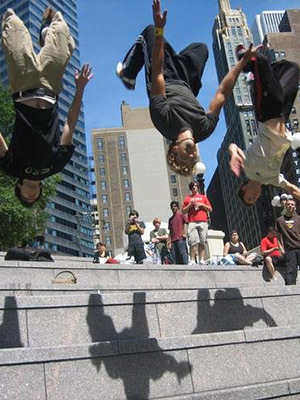 Chicago Parkour was one of the first Parkour communities in the US, founded back in 2003 by two brothers Andy (Ando) and Ryan (Cloud) and their friend Matt. The community meets up to train fairly often at various training spots or gyms, all of that coordinating is done on our Facebook Page. Parkour is the art of getting from point A to to point B as efficiently as possible by moving over, under, or through any obstacles in your path. Freerunning is generally seen as the more creative side of that, focusing more on fun or flashy movements and less on practicality. A Jam is a gathering of Traceurs at a predetermined spot to train together, almost always a very relaxed environment. Jams are open to anyone and everyone who would like to come out, everyone is encouraged to join in and train but if they just want to hang out and watch, or bring a camera to get some video footage or pictures, that’s perfectly fine too. Larger Jams some times extend invitations out to a national scale and become National Jams, like our Annual Chicago Colossal Jam. These, like Jams, are gatherings of Traceurs. Training Sessions are often smaller and more dedicated though, focusing more on pushing yourself and progressing.